Mildred Jenkins Simmons was born July 30, 1921 in Logan, West Virginia. She left West Virginia after high school, New York bound. There she married William Simmons and out of that union, a son was born. Mildred worked as a nurse in Bronx, NY hospital for over 40 years. After retirement she moved to Philadelphia, Pennsylvania. There she volunteered at the Philadelphia Naval Yard teaching arts and crafts and macramé to children. 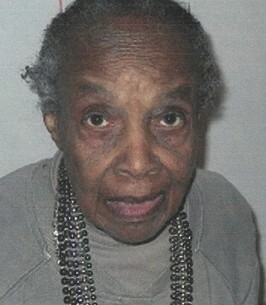 In her older years, Mildred moved to Delaware. She first lived in Ingleside Assisted Living Home and later moved to Brandywine Nursing Home. There she remained until her expiration. Mildred was 97 years old. Mildred was preceded in death by her mother, Maggie Harris, brother, Drewie Jenkins, two sisters, Margarette Jenkins and Lucille Morehouse. Left to celebrate her life are her son, William D. Simmons, and his wife A. Christine Simmons; three grandchildren, Evan Simmons, Drew Simmons, and Diana Simmons; one great granddaughter, Dayanna Blackwell; step grandchildren, Tasha and Aiden Bryant; and a host of friends. To send flowers to the family of Mildred J Simmons, please visit our Heartfelt Sympathies Store. My condolences. Sorry to hear of the loss of your Mother. I am very sorry for the recent loss of your dear loved one. I have a brief encouraging message I would like to share with you from the Bible. The Bible can be a great source of both comfort and hope during this most difficult time in your lives. For an example, at Revelation 21:3-5 it assures us that the day is soon coming when our most loving Heavenly Father is going to wipe away the tears of sorrow from our eyes and that even pain and death will be no more. I hope after reading this it will be of some comfort to each one of you. I know the pain you feel now is hard to bear, but may the happier times of so many years, help calm the grief and pain that you feel. And when all things are said and done the God of mercy will be the one who will release our love ones from sickness and death. Isaiah 25:8. So please except my condolences and sympathy for your loss.